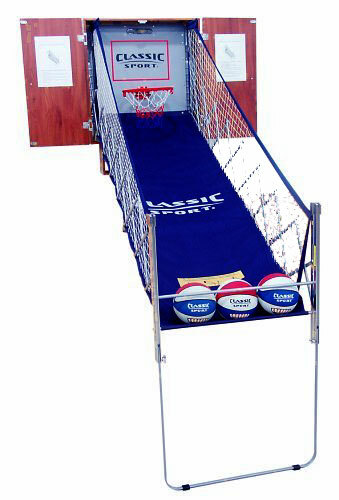 Turn any room in your home into your personal basketball court with arcade-style hoops. 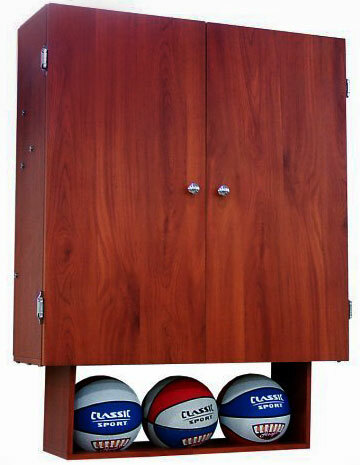 With a 7' retractable ball return, you have full-sized hoop action right in your own basement or home game room. Played alone or with a friend, the infrared electronic sensor with multiple time settings keeps score for up to two players. Game includes three basketballs and air pump. 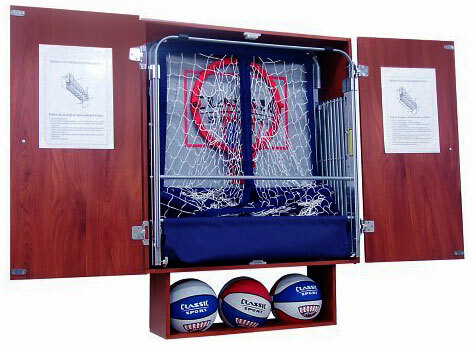 Cherrywood-finish cabinet’s unique Fold-Away design fits game neatly into cabinet and holds the three included basketballs on its built-in shelf. Arena-ambient audio sounds and announcer play-by-play for made shots to enhance your game experience. Audio disable switch. Simply plugs into any electrical outlet. - Closed 29 1⁄2"w x 8 3⁄8" deep x 31 1⁄2"h.
- Open 29 1⁄2"w x 85 5⁄8" deep x 88 7⁄8"h.